I hope the new year finds you rested, restored, and energized. I’ve been cleaning house, sweeping up the dust bunnies from under the couches, and staring at my piles of laundry. I’m sure many of you have been doing the very same thing, but maybe getting some laundry done. In the middle of the mess, we are still blessed. Blessed to have a roof over our heads. Blessed to have dirty laundry. Blessed to have the sofa, dust bunnies and all. I am really excited about all of the possibilities this year. Last year we were able to reach out to orphans in Mexico, Nicaragua, and India. We sent dresses to little girls in Mexico. Dolls arrived by the suitcase to children in Nicaragua. And we sent more items than you can shake a stick at to India. It had to be sent over in a crate by ship. That’s a lot of love sent overseas. We sent a gaggle of sock monkeys to children at a burn camp. We made quilts for homeless children in Michigan. We collected 3,904 items for charity!! WE did this! This year is going to be even more exciting. Get your children involved, include your friends, now is the time to spread HOPE. I cannot wait to see all of the wonderful things you all create. You all are amazing. Much of the nation is currently overwhelmed by this Arctic blast that has covered our landscape. It’s cold out there and what better time to launch a project that allows you to sit on your couch and knit or crochet. For Project 6, we have partnered with The Orphan Foundation of America’s Red Scarf Project. Yup, get your needles and yarn out because it’s time to make a scarf. A red scarf! The Orphan Foundation serves thousands of foster teens throughout the U.S. They provide college scholarships, connect them with mentors and internships, send them care packages, and testify for them before Congress. Each year 25,000 students ‘age out’ of the foster care system and the Orphan Foundation is committed to helping them become tomorrow’s successful citizens. They launched the Red Scarf program in 2005 to send red scarves to warm the hearts (and necks) of college bound youth. They began taking these donations to include in their Valentines Day care packages. We have partnered with the Orphan Foundation to make scarves to send to these students. The scarves can be knitted or crocheted and we have provided a pattern from Vickie Howell to help you along. The pattern will be in the sidebar, with a link to it here, later today. A huge thank you to Vickie for donating this pattern for the Craft Hope book. She is amazing! Scarf Size: Apx. 60″ long and 5 -8″ wide. Scarves should be long enough to wrap around the neck. Style: Think unisex collegiate. Ask yourself if your son, brother, husband would appreciate the scarf. Fringe is optional. Yarn: Something soft. No mohair as some people find it itchy. Colors: Red! However, this could mean burgundy, cherry, red stripes with other colors, or multicolor hues including red. Other unisex colors including black, navy, teal, olive, and gold are also welcome. Finished and Tagged: For a personal touch, include a tag that says ‘Handmade for You’ with your first name, city, and Craft Hope. Donors have also included washing instructions, messages of encouragement, gift cards, burger bucks, stamp books, etc. *You do not have to use the pattern provided to knit a scarf. You may knit or crochet any scarf you’d like. Also, they only accept knitted or crocheted scarves. Thanks for understanding! As the Orphan Foundation collects many scarves please be sure to include a note saying it’s from you and Craft Hope. That’s the best way for them to keep a tally of what the Craft Hope community has sent in. Also, in your return address please put Craft Hope under your name so that the sorters can put them all together. The deadline for this project is Valentines Day, February 14th! Please spread the word by posting this project on your blog. 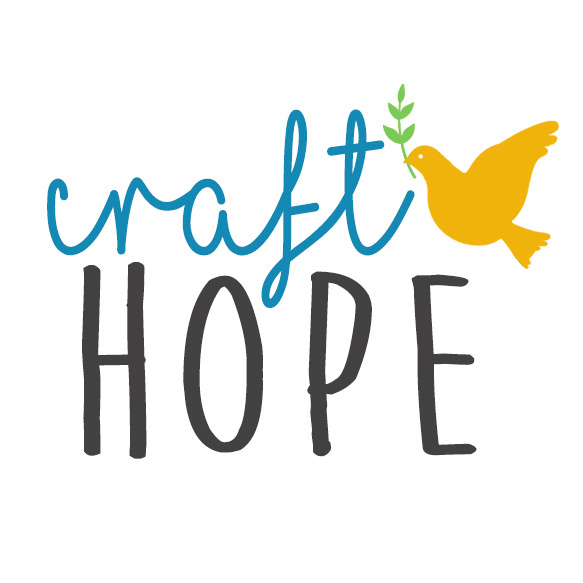 It is through this amazing blogging network that so many know about Craft Hope. Thanks for all you do. You make the world a better place! Hey y’all, a few people have expressed concern about the Orphan Foundations December deadline for scarf collection. Just to let everyone know, we have an arrangement worked out for Project 6. So rest assured that all of the scarves will be delivered into loving hands. Cheers!